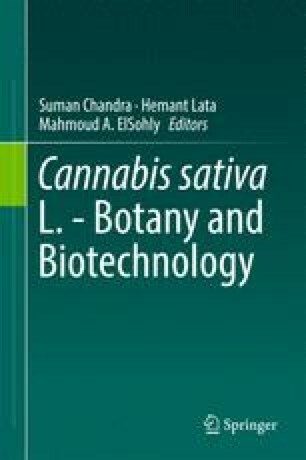 Over the last twenty years, the development of molecular markers in Cannabis sativa significantly contributed to the advancement of knowledge of the genome structure of the species. Male-associated markers have contributed to the understanding of chromosome structure and composition of sexual chromosomes; microsatellites have highlighted the extent of the genetic variation of Cannabis; research on chemotype-associated markers has been of great relevance in the development of an increasingly refined view of the biochemistry and physiology of the chemotype determinants in Cannabis. Moreover, the application of extensive sequencing, which enabled the determination of the first Cannabis genomes and transcriptomes, has boosted the availability of sequences associated to specific traits. In this chapter, the development of different types of molecular markers and their application to the most relevant traits for Cannabis breeding are described and discussed.